After being inundated with comments on my tweet containing the slow motion clip of red kites feeding at Gigrin Farm, I have decided to try to answer some of the questions posed on here. This post will grow over time, and will I am sure, be edited to reflect opinion from others, that in turn affects my understanding of the whole situation. Please feel free to email me if you believe something is wrong here, or you wish to add extra information. Further information can be found via search engines, and on the RSPB's website, including details about the reintroduction programme employed in England and Scotland. 1Where is the feeding station featured in the video? This is Gigrin Farm, based in Rhayader, Powys, in mid-Wales. Always check before visiting, as the farm isn't open every day, outside of school holidays. 2What birds visit the feeding station? Mainly red kites, but other birds of prey such as buzzards also visit. Grey herons and corvids (carrion crows, rooks, ravens etc) also take advantage. The farmer throws out raw beef (fit for human consumption) on to the meadow, in small pieces for the birds to eat. The feeding of the kites is an EEC licensed operation and is monitored by DEFRA. 4How many kites visit the feeding station? Up to 600 kites, maybe more at times. Numbers vary between seasons. 5Do the same kites visit every day? No, not always. They visit when they need to. The food is supplementing their normal diet. 6What do kites normally eat? 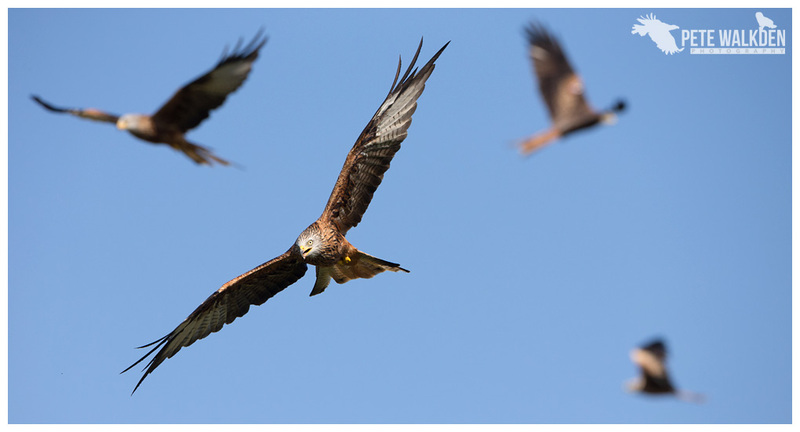 Red kites are scavengers, and carrion forms a large part of their diet, often swooping down to take roadkill. This is why their numbers are increasing around shooting estates, where game birds such as pheasants and partridges often get hit by vehicles, and the kites take advantage of the carcasses lying beside the roads. They also spend a great deal of time wandering around in fields eating worms and other small grubs, much like buzzards do. They will take small rodents, and young birds that are unable to fly yet, such as wading birds, wildfowl and young gulls. 7Why are the kites being fed? The farm became a feeding station in 1993 following a request by the RSPB to help feed the kites roosting on the farm, providing them with regular food. This has helped establish a growing population of red kites in Wales, from a point where they were almost extinct in the area. 8What else does the farm do? Gigrin is also a red kite rehabilitation centre to care for injured birds, receiving their first patient in January 2003. 9Does the feeding station stop the birds from spreading out and settling elsewhere? No. The kites are spreading out from this area, roosting and nesting elsewhere, miles from Gigrin. Kites from here can now be seen as far east as Shropshire and north as Snowdonia. 10Are there other red kite feeding stations in the UK? Yes, several. There is even another one near Gigrin, at a place called Nant y Arian that must see different birds to those that visit Gigrin, as feeding occurs at a similar time. 11Kites have been known to raid picnics and scare children. This is something that has happened recently in the Chilterns. Red kites were reintroduced here as part of a nation-wide programme to establish these raptors in the UK once more, as they were before they were persecuted and wiped out. Unlike Gigrin where the food is put out responsibly, locals (and visitors) in the Chilterns have put out their own food for the kites, to encourage them to swoop down for it. This has caused the kites to become familiar with such actions, and now seeing food laid out on a picnic table or BBQ, can encourage them down for it, much like some gulls do in coastal resorts, as a result of people feeding them chips etc.. Presumably, if people stop feeding the kites in this way, they will return to looking for food elsewhere, and such incidents will cease to occur. No they don't. If anything, these are one of nature's cleaners, and will pick up dead creatures to eat, thus removing the source for possible disease. 13Feeding them is unnatural and should be stopped. We humans wiped these birds out years ago, until only tiny populations hung on in rural, safe areas. Unlike now, surveys didn't detail how many of these birds were once living in this country before they were targeted, so it is perhaps difficult to determine how many we should have in the UK. Reintroduction programmes using birds brought in from Sweden and Spain, for example, have helped establish these birds across various regions of the UK, and over time, the kites are spreading to new areas, to repopulate them once more. In Wales, no foreign kites were used. The numbers here have grown over generations, from perhaps just one pair of red kites, and the feeding station has helped these birds find food when they struggle elsewhere. The action of putting out the food is indeed unnatural, but is clearly helping the kites, and has seen their numbers grow from around half a dozen in 1993, to over 600 in 2013. Perhaps at some point the farm will phase out the feeding, but then again, it serves not only as a means to help the kites, but also brings much needed tourism to the area, and generates money from helping nature - not something easily done these days. As for stopping helping wild birds? Putting out raw beef for these kites is seen to be a bad thing by some, yet how many of those people have feeders in their gardens? The birds taking seed and other types of food from our gardens are just as wild as these red kites, so where's the difference? Wild birds need our help. We have taken away their habitat for our homes and farming, removed their sources of food, and stopped them from nesting and/or roosting by changing the designs of buildings, for example. Therefore some of us put up bird nest-boxes or roosting sites, and put out feeders and additional sources of water for them, and we get great enjoyment from seeing wild birds take advantage of such acts. The same problems have affected birds of prey, and worse, given our history of persecuting them (still ongoing, in certain areas, despite it being illegal now), yet people see these birds as not being entitled to the same treatment as perhaps that cheeky little robin seen each day in the garden. 14Having so many apex predators must affect the local ecosystems. People have commented on social media that they have seen fewer garden birds and other raptors such as kestrels and barn owls, since red kite numbers increased, but it isn't clear if the kites are to blame. It is thought that vole populations and climate change are factors affecting species such as kestrels and owls, and kites, which mainly scavenge their food, are unlikely to cause such population declines. The birds we see in our gardens aren't always the same individuals, and it is known that a large percentage that call in, are simply passing through. Therefore, declines in numbers could come from factors elsewhere, such as land-management and farming methods, affecting these birds before they reach our patches of land. Red kites will take small rodents, occasionally small birds (though most are simply too fast for the kites to catch), young birds (when they're unable to fly) and invertebrates, especially earthworms. Nature, if left alone, will find a way to balance all ecosystems, and in theory, if there were too many predators around, eventually a shortage of prey and areas to set up territories would see a decline in their numbers, balancing the ecosystem out. The problem comes from us as humans, affecting such ecosystems through our own management of species within them, and often results in us having to target certain species either from boosting populations or by culling others, to maintain the balance. 15Do all the kites live nearby? Some will surely have territories near the farm, whereas others will be passing by. Watching how high kites can fly using thermals, it is easy to see how they could drift across the whole of Wales in little time at all, and from such a lofty vantage point, see the others gathering, and choose to join them. 16There are too many red kites here. Available food, territories, nesting sites and roosts will eventually reach saturation point in areas with high numbers of these birds, and they will have to spread out to new regions. This is already happening, as the kites, once only seen near mid-Wales, can now frequently be seen over the border, in Shropshire for example, or north, in Snowdonia. It is remarkable how they gather in such numbers for feeding, yet only an hour afterwards, they've dispersed almost completely.